Hello Halloween lovers! We actually trick-or-treat in our neighborhood tonight. I have been known to stretch the Halloween season around my house and let my kids dress up in Halloween garb way before and after October 31. 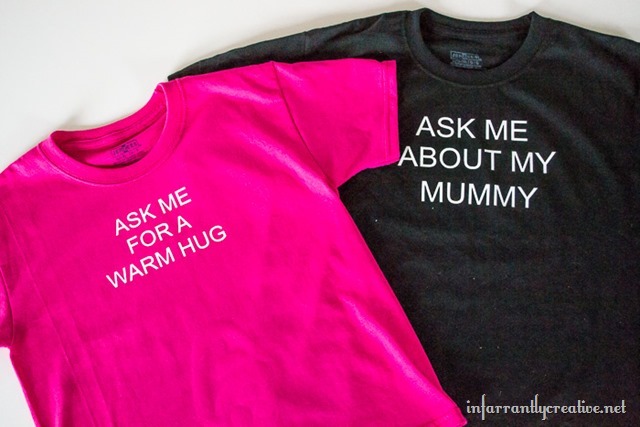 These fun t-shirts are sure to make your kids giggle, and possibly get them out of their costumes for a minute. What’s not to love about a shirt you pull over your head? I am giving you two options if you own a Silhouette Cameo machine with a mummy and Olaf shirt. My kiddos designed these themselves. 2. Cut out your vinyl. Make sure the shiny side is down on your cutting mat. I always make sure I do a test cut when I am working with iron-on vinyl because some are thicker than others. 3. Once the file is cut out start weeding your design. This is just a fancy word for removing the areas of vinyl you don’t need. I use a stick pin to do this. 4. Place the sticky side down on your t-shirt and position it where you want it. 5. Using a lightweight piece of cotton fabric (press cloth) on top of your vinyl iron for 30 seconds on high moving the iron constantly. 6. Once cool peel away the sticky backer sheet. Then take your press cloth and iron on top of the design. I also inside the shirt out and iron the opposite side too, just to make sure you get a nice adhesion. 7. Next, making sure the shirt is inside out and your design is facing the right way, iron your face on the underside of the shirt. Repeat steps 4-6. For more T-shirt ideas click on the picture below to be taken directly to the post..